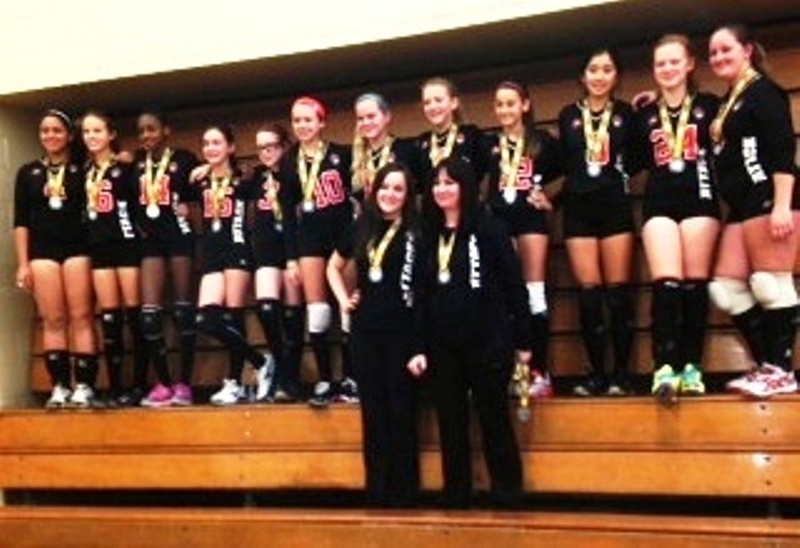 November 30th saw the UTSC gymnasium descend into Chaos as the girls of the 13U Durham Attack Black hit the court to vie for the Provincial Cup. In a day of struggle and success, Chaos gamely fought their way into the tournament finals and left with a little shine around their necks. The day commenced with a match against the STVC Infinity. In an attempt to prove there is nothing greater than the infinite the Scarborough club came out strong in the first set. In a back and forth match that saw us occasionally in chaos ourselves, the girls fell 21-25. Quickly recalling, however, that the concept of infinity is essentially a paradox our girls rallied in the second set for a dominant 25-17 win, forcing a third game. This game, marked by excellent setting and hitting, as well as the relatively steady tossing of Coach Erin, ended 15-12 in our favour, and sent Chaos still undefeated into their second match against the Ottawa Maverick Sidewinders. In nature, a sidewinder (crotalus cerastes) is a venomous pit viper native to desert regions of North America. Fortunately, Scarborough in November is no desert and our ladies in black were packing ample anti-venom as they calmly dispatched their cold-blooded opponents from Ottawa in straight sets by scores of 25-17 and 25-14. The patience and cohesiveness shown in their attack indicated that Chaos were confident and primed for their next challenge. That next challenge for the girls came from another Ottawa based team: the Fusion. Whether their name references the nuclear reaction or the razor is unclear, but there was no bomb or close shave to be found in this meeting. The controlled passing, strong hitting and consistent serving shown earlier continued as the team produced 25-6 and 25-7 sets for the win. Chaos’ fourth game of the day saw them in the semi-finals staring through the net at club mates: Durham Attack White. In this battle the colour white did not mean surrender. Despite it still being Fall, someone should have posted an Avalanche warning as this well-drilled team of Durham girls made Chaos feel as though they were skiing the Alta Zero at Jackson Hole. While Black trumped White in the end by scores of 25-10 and 25-21, the story of this match was the scrappy play of the Avalanche and the need for Chaos to get their skis back in parallel for the finals. The girl’s Provincial Cup journey culminated in the championship match against a strong STVC Titanium side who came out swinging in the first set. Struggling back from a deficit of ten points the girls fought hard, only to see the set end 20-25. Proving, however, that titanium is not bulletproof, (sorry David Guetta), Chaos came out in the second set determined to show that when you shoot them down they won’t fall. Buoyed by the supporting cheers of their club sisters – the Heat, the Black showed their mettle by storming back for a 25-19 win. The third and deciding set, marred by phantom net touches and replayed balls, was a closely contested affair that saw Chaos play with the hearts of champions only to be denied 15-13. As the sun set on Scarborough our lady Chaotics smiled for the cameras of their adoring and exhausted fans. Around their necks shone their hard won silver medals. While their parents and coaches were proud and impressed by their accomplishment, the girls no doubt thought only of the day that they would meet Titanium again, certain that the outcome will be different. They left UTSC aware of their great potential and also of what they will need to do to one day wear gold. They will get their next opportunity at the 14U Girl’s Challenge Cup on December 7th. CONGRATULATIONS CHAOS ON YOUR WIN! !